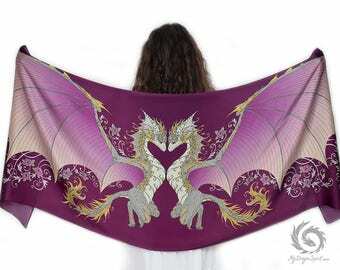 This Love dragons scarf is super cute and fun addition to your outfits. They are little guardians who will bring a touch of magic into your everyday life. 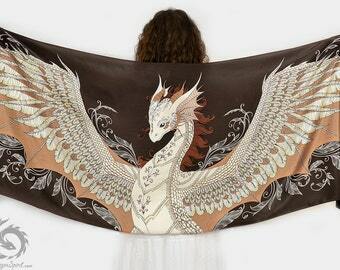 So put the scarf over your shoulder and fly to your next fairy-tale adventure. 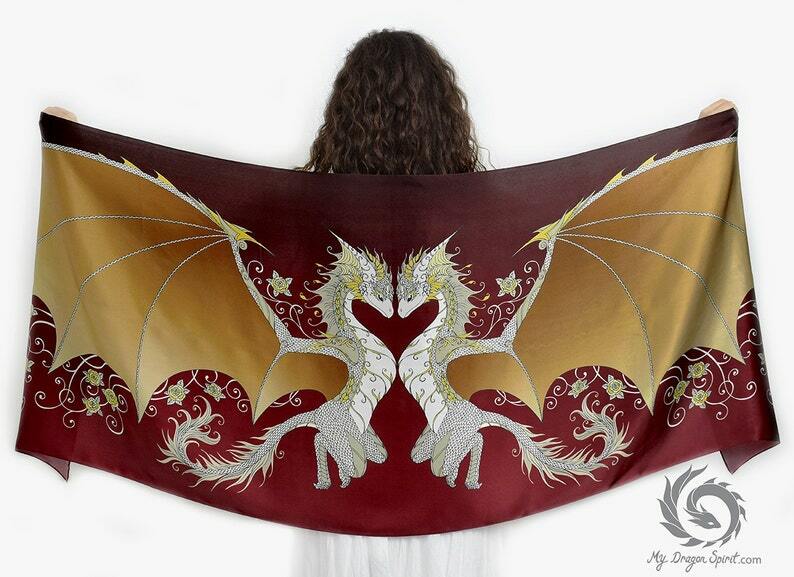 I designed these scarf with great attention to details and with a vision to give you something special and unique. All designs are delicately hand drawn with ink and after perfecting each detail the image is prepared for digital printing on fabric. 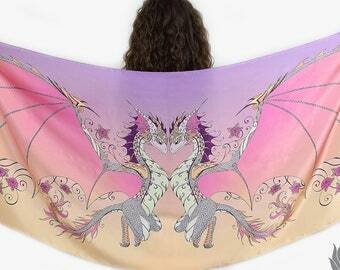 Scarf is made from 100% Silk Satin. It is a natural and non-synthetic material that breathes and drapes beautifully. Material is light and very soft to the touch with amazing feel on the skin. Scarf has a lustrous shine texture with slightly crisp feel. The opposite side is less lustrous but still has a very smooth surface. Scarf is printed on one side. On the other side you can see a slightly lighter, more paler version of the print. *Please note that colors can slightly vary from monitor to monitor. 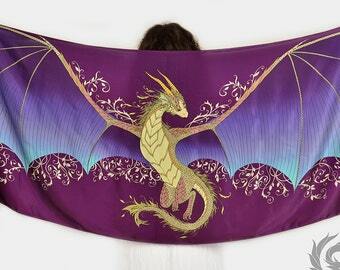 Scarf measures are approximately: 200 cm by 70 cm (78,7" X 27,5"). The edges are finished with machine-rolling ham. Silk is a delicate natural fiber and must be treated appropriately. The wash and care instructions are included. All orders are shipped by registered priority air mail. You will receive a tracking number when it ships to guarantee delivery. I ship worldwide. 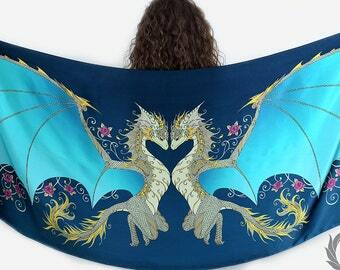 Absolutely stunning shawl! So unique and interesting. 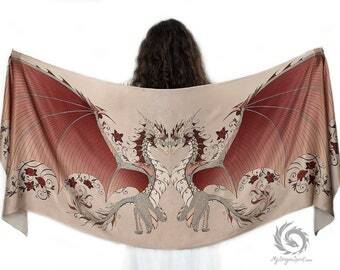 The design is amazingly detailed and it works perfectly on the silk fabric. Gorgeous. Thank you!! 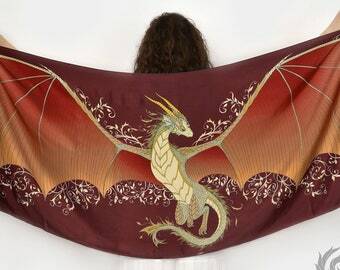 Wonderful Seller FAST Shipping for overseas Beautiful Dragon Scarf..Careful Packing Would buy from again..This is a Christmas present for a friend and I was so pleased with the scarf and getting it here in great time for me to ship to her...I Thank you Ever so Much.. Your order will be shipped within 1 - 2 business days. After your order is shipped, the delivery time varies depending on your location. Delays can sometimes happen due to customs clearance, logistics holdups, holiday season, and other factors. Please understand that I cannot control this so please be patient.